Let's say you own an apartment complex and want to provide covered parking for your tenants, or you are a restaurant owner and are tired of losing business when it rains or its too sunny and hot outside. If you are in this type of situation, the first thing you will probably do is Google a company to provide you with a quote for a carport or patio cover. So you get a quote and decide to go through with it. But what if you would have made your carport a solar carport or your patio cover a solar patio cover? Well let's take a look at why you come out way ahead when you choose to use the sun. When you run a business, you are allowed to depreciate equipment and items like carports and canopies if they facilitate your business. Typically these items receive a 15 year depreciation schedule from the IRS. So the value of depreciation after 15 years will basically be the installed cost x your tax rate. The canopy never pays back for itself, but you do get to write off a portion of the expense. Let's look at a solar canopy's (or carport) benefits. With the types of solar structures we design and install, you typically are allowed to take the entire installed amount and depreciate it over 5 years, and it is front loaded! Plus, you can receive a 30% Federal Tax Credit on the installed cost of the solar structure. You also will receive substantial energy savings by generating electricity from the sun! 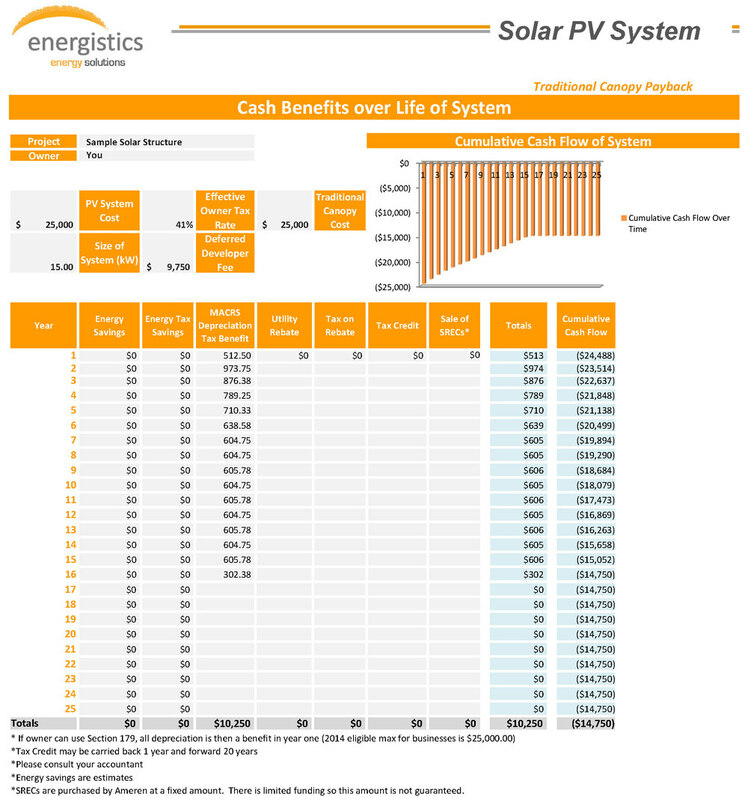 The upfront cost may be higher, but the benefits make solar structures a no brainer! 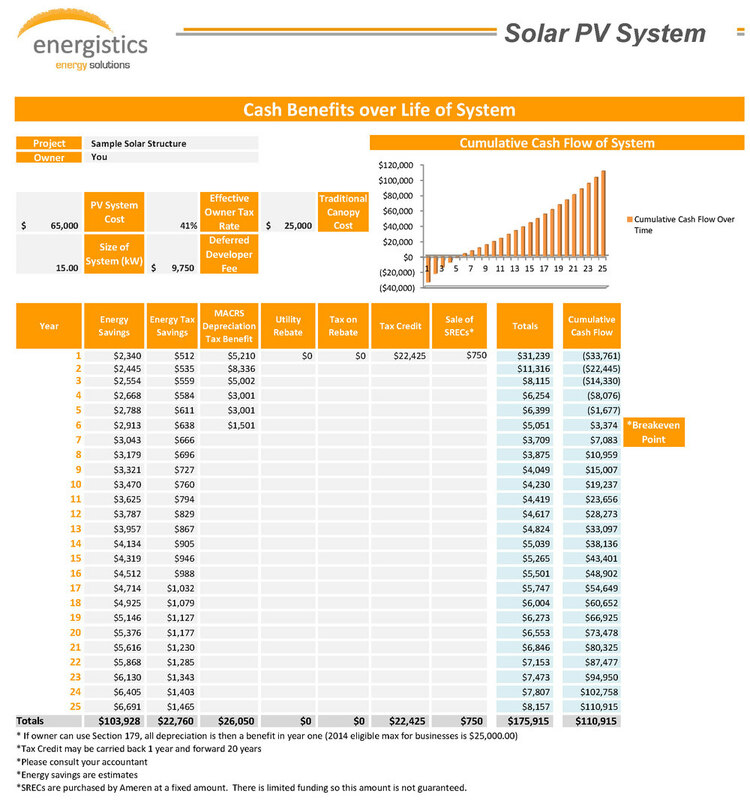 If you already have to spend money on a carport or other structure, the decision to go solar will payback even quicker than these tables show because you have sunk cost so you would only be looking at the delta between the traditional cost and the solar cost. If you have any question or interest in about Solar Structures, please give us a call at (314) 374-3687 or shoot me an email and glafser@energistics-mo.com. If you are in the St. Louis area please also feel free to drop by our office!